Melanoma, also called malignant melanoma, is a cancer of the skin. It occurs when the skin cells that produce the pigments found in freckles and tans, also known as melanocytes, become cancerous. They are deemed cancerous once those cells begin to grow at an abnormally quick rate. The primary cause of Melanoma is exposure to ultraviolet light, also known as UV light, from the sun’s rays. Tanning booths also emit UV rays and can contribute to the potential of melanoma. When those UV rays hit the pigment-producing melanocytes, they can damage the cells, resulting in in uncontrollable growth. 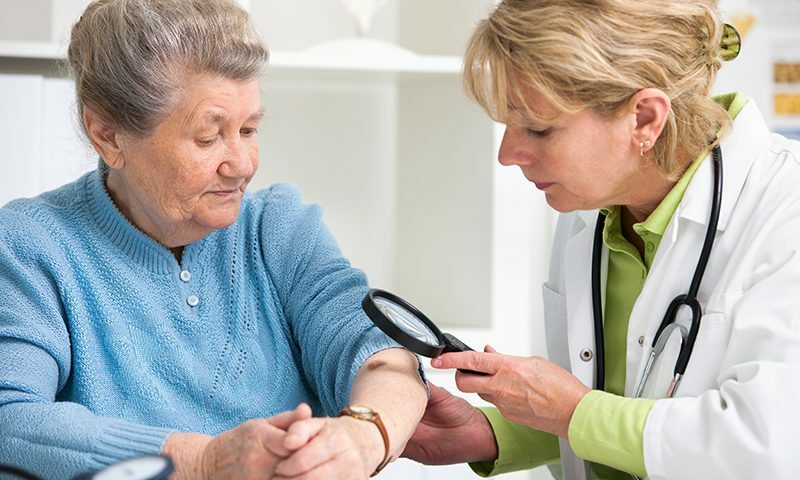 This growth can become cancerous and form the skin tumor that needs to be removed or treated when an individual is diagnosed with skin cancer. Melanoma can occur at any site on the skins surface, however men most commonly have it on their back and chest, while women usually get it on their legs. In men, cancerous skin cells are usually found later in life, where women can develop skin cancer at any age. If not caught early, melanoma can quickly spread to other parts of the body, making it very dangerous. Individuals who had bad sunburns as children, have fair skin, excessively tan, and those who do not use sunscreen regularly are more at risk for developing melanoma than others. Sunburns and tanning lead to the potential of damaged melanocytes, which can lead to abnormal growth of skin cells. Fair skinned individuals are also at risk because they have less pigmentation in their skin to protect them from the UV rays. Using sunscreen is the first step to protecting yourself from harmful UV rays, and those that go without are increasing their chances of developing skin cancer. If an individual has a family history of melanoma, they are also more likely to be at risk. Melanoma is a tricky cancer because cancerous areas can start out as seemingly normal looking moles or freckles on the body. Cancerous areas can develop anywhere on the body, including internal organs and eyes, but they’re most commonly found in the areas most frequently exposed to the sun: the head, face, shoulders, arms, and legs. A good tool for understanding if a mole could be melanoma is knowing your “A.B.C.D.Es,” also known as Asymmetry, Border, Color, Diameter and Evolution. If a mole has become asymmetric, its border/color has changed, or it has grown, you may have developed a cancerous area on your skin. When in doubt, visit Dermatology Associates of Virginia, to make sure that we catch any cancerous tumors before they develop into something more dangerous.